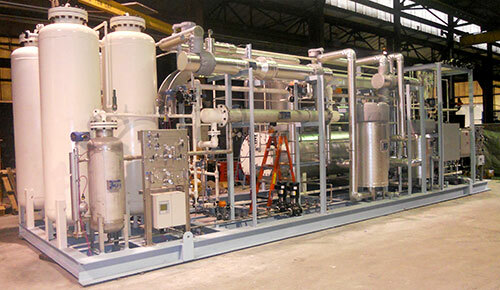 Cotting Industries offers complete Hydrogen Gas Production Plants using its patented Double-Tube reformer for hydrogen generation and Pressure Swing Adsorption for hydrogen purification. Double-Tube reformers and Pressure Swing Adsorption systems may be purchased separately. providing for fully automated startup/shutdown, unattended operation and remote plant monitoring. provides long-term hydrogen cost savings. Compact, simple and efficient proprietary Double-Tube reformer for hydrogen production. Fully integrated waste heat boiler for steam production. Feed gas desulfurizer for long catalyst life. Water-gas shift reactor for maximum hydrogen yield. Four-vessel pressure swing adsorption system for hydrogen purification. Factory installed process control system, instruments, light fixtures, and plug-and-play electrical wiring system for easy installation. Single point utility connections for convenient site tie-in. Automatic emergency shutdown system for maximum safety. 100% factory assembled on a single portable steel skid for high quality, fast delivery and quick installation. 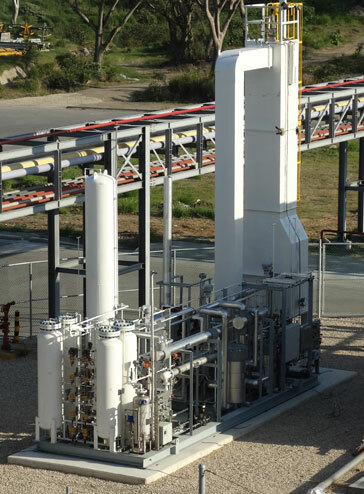 Capable of processing multiple feedstocks including natural gas, biogas, propane, LPG, and naphtha. Designed to meet the codes and regulations required for installation in North America, Europe, China, and Japan. The process flow begins with a hydrocarbon feed gas entering the plant where it is preheated and sulfur compounds are removed via zinc oxide desulfurization. The sulfur free gas is mixed with saturated steam and further preheated before entering the reformer. In the reformer, the steam/hydrocarbon mixture is converted to hydrogen and carbon monoxide at high temperature in the presence of a solid catalyst. 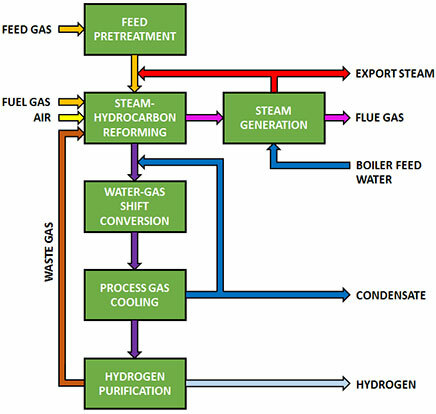 The hot reformed gas from the reformer is quenched with water and passed through the high temperature shift converter where steam and carbon monoxide are converted to additional hydrogen and carbon dioxide. The process gas is cooled and then purified in the pressure swing adsorption system. Waste gas from the pressure swing adsorption system is burned as fuel in the reformer. The hot flue gas from the reformer is used to generate the steam required by the process and additional steam for export.